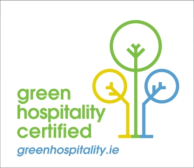 then Herbert Park Hotel can certainly tick that box! Intimate, yet an informal wedding venue in a stunning location overlooking the leafy Herbert Park in Dublin 4. We offer a perfect venue for exclusive intimate wedding lunches or dinners. The Pavilion Restaurant with a substantial patio space overlooking Herbert Park is a wonderful setting for your drinks reception. Herbert Park itself is an ideal backdrop for wedding photographs. The award-winning Pavillon Restaurant can be booked exclusively or as a semi-private space. Your wedding party can adjourn to the Bar following the meal to relax for the evening. Personalised service with an exceptional and experienced team. We can tailor a menu to suit your individual requirements or budget. We also have two exceptional Penthouse Suites which can be booked for your wedding night. For added convenience, why not book the Penthouse Suite on the night prior to ensure you are relaxed and refreshed for your special day and have the added benefit of using the Suite as a base on the day of the wedding. We can also offer preferential accommodation rates for your wedding guests.